It’s spring here. Everything is greening up, the flowers are peeking through. It’s truly a beautiful time of year. However, this year as I’m going through some personal issues and watching a good friend die, I find myself a bit bitter. But, as I walked Mayiah today and was looking around I noticed some purple flowers that have popped up. And I realized. Mother Nature does not promise that life will be pleasant all the time or even enjoyable sometimes, but she does promise this with spring: it’s a time of re-birth. Of renewal. And yes, it also can be a time of death. But even in the wake of death today I was able to look around and find something beautiful — that gorgeous flower that despite the rather odd spring weather pattern we’ve had managed to poke out on schedule. As I prepare to say goodbye to a friend, somebody who has been very good to me over the past several years, I find myself hurting…but life is still full of promise and hope…just wish we all got to keep the ones we love near us…. Yes, I am Mayiah Brulee’s mom. No, Mayiah is not a child. She is a dog. A small 4-pound toy poodle with more grit and attitude than I could possibly muster on my worst day. With that said. Mayiah is the “queen bee” of the household. She’s my very spoiled “baby.” She seriously owns more clothes than I do. Far more. And to boot, Mayiah, who is a DOG, has started receiving her very own e-mails from an online dog boutique that I shop at. You read right. She gets emails. They remind her to tell her “mom” (that’s me) that there’s a huge blow-out sale online. Today’s email stated that they are having a winter clearance sale. Now, if Mayiah could read she’d be bugging the crap outta me to get her that $75 cashmere sweater (i’m not kidding) that is on “sale.” Fat chance Mayiah poo. My dog getting e-mails, now this is a true sign of the times. Hilarious. As her “mom,” however, I must say I enjoy it. They do know how to cater to nutcases like me!! I finally had my personal encounter with Woody Woodpecker. In other words, the pileated woodpecker. I’m a bird watcher that doesn’t have enough time to bird watch as much as I’d like. 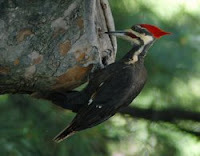 The pileated woodpecker has been at the top of my life list for quite some time. When I visited my Aunt Mary Lee in Idaho back in 2003, the darn bird never came near. Immediately following my departure, you guessed it, he showed up. It seemed like I would never see one. With all that said, I was laying on the couch last Sunday and I glanced up in a tree. I saw the distinctive top knot and noticed he was so much bigger than our woodpeckers. I couldn’t believe it. I exclaimed “that isn’t a regular woodpecker! !” And the excitement grew when Linda identified the bird for me. Yes, it was indeed the great pileated woodpecker. IN MY OWN YARD!! So yeah. Now I have to come up with another “ultimate bird” to spot. I would like to see Woody again, but I’m just so thankful he showed up. Amazing sight! Meant to post this on Sunday…sorry…consider it last Sunday!! Those words have become an integral part of my vocabulary. And I just realized that today alone, I’ve used them all day. And I’m not kidding. I’m no different than anybody else trying to make it in the world, I just need to gripe for a few minutes. From keeping with work, working on my MBA, choir practice and in general trying to be a good friend and person, I don’t have time to deal with it!! And today it was a TV show I was trying to find. After working five hours this afternoon on a paper, and still facing two articles for the newspaper, truly…I didn’t have time to search for a dumb show that will tell me how to get thin. Seriously! But I did want to see it. I wonder if this guy can really make me thin like the title of his show on TLC states. Right now, I don’t care. Ah…time for some relaxation. But I don’t have time to deal with that either. The newspaper articles await. They’ve waited out their turn on my to-do list. The signs of spring are all around me. The tulips are peeking out of the ground. The lilles are poking their tops out too. Even the birds seem to be chirping louder and with more intensity trying to prepare for the next brood. But for me, living in an agriculture-based area, the ultimate sign of spring is the farmers out working the land and listening to the hum of the plows and planters until he wee hours of the morning. For you city folks, this might be an annoyance, but for agriculture folks, this is the ultimate sign of spring. And it’s beautiful. I smile when I look across the field in the middle of the night and see the faint lights of the plow running up and down the field. I love it when I am waiting to get down my road because of a cloud of dust kicked up by a plow, a sprayer and other random farm equipment. It makes me smile. It doesn’t bother me at all. It’s one of my favorite things. It’s part of living in the country and respecting the work our farmers do. If you live in an agriculture area, be prepared for agriculture actitivies. Got a bit of topic there, but it’s here. Spring is here. Or at least well on her way. And it’s so unbelieveably nice to see the farm equipment out and about again. "I’m getting married in the morning!!" No, I’m really not. It’s a part of the Broadway number we are singing in choir. And if you ask a co-worker of mine, I’m driving her nuts singing these songs. Each Tuesday morning in the newsroom (after choir practice Monday night), I chat this poor co-worker the lyrics to one of the Broadway songs. To which I usually get a “damn you!” response. Hey, it gives us both a good solid laugh early in the morning and something to sing about. Signing is good for the soul. Whether you think you can sing or not, it’s good for you. But, it’s just funny to spread the joy with the repeating Broadway montage. It’s enough to drive me batty. And I’m taking my co-worker with me! Been bad about blogging lately. Sorry to those who actually read this and are wondering what is going on. Today I’m going to write about my conflict with paper towels yesterday. We have these tri-fold (evil) brown paper towels at work. I had finished washing my hands and went to grab a few of them and discovered that they were stuck together. So, instead of getting a few, I got several. And then several more as those were stuck together too. Now this would have been funny, except that I was having trouble dealing with stuff at work and people’s attitudes so this just about sent me over the edge. So instead of calmly pulling the paper towels apart, I flailed them a bit, spreading several more into the sink, on the counter and a few on the floor. By this time I thought I looked pretty silly and then chose to calmly pick them up and stack the ones that were still dry. In the process, I knocked the other pile over. Yes, the neatly stacked pile. So, frustration once again mounted as I now had to pick that pile up. Somewhere in between picking up the entire pile of paper towels that were now everywhere, I realized: That was small stuff. SMALL. A friend once told me that it could be as simple as breaking a fingernail that sometimes sets us off. Yesterday the paper towels was my “broken fingernail.” It’s still small stuff, I know. But when the small stuff starts to get to us it’s time to stop and look at the bigger picture and figure out what is really bothering us. Scattered paper towels should have been funny. Not something that raised my blood pressure.